Love this site, check it often. 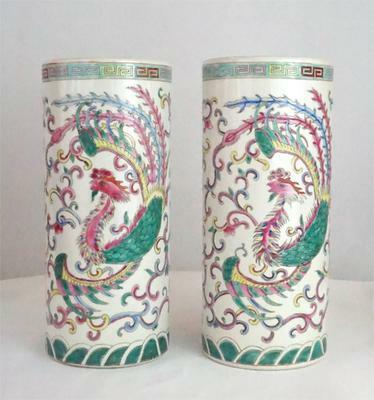 I'm having trouble identifying the period of these vases based on the characters. I keep going back and forth. Thoughts? I should have said "good resolution" and "closeup" instead of clear pictures. This pictures only shows the shape of the bottom, without seeing minute details or consistency of the bottom. Anyway, I think it could be early early republic period, not older, due to the white glaze; the colors look more like 20th century. The mark is irrelevant for age as it is apocryphal. Stamped marks would not have been in common use before about mid-19th century. Yes, the use of this character for "made" is unusual, but it has been used occasionally. You perhaps know that it was more common later, from the second half of the 20th century as simplified character. But it isn't really simplified. It existed already in ancient times (it is also mentioned in the Kangxi dictionary). I don't think that we can say, based on this character alone, that the mark is from the second half of the 20th century. If I remember right I have seen it used as an alternative mark, but don't remember if it was on Qing or Ming porcelain. Not widely used, though. There are 2 ways to write the character made/make, according to a dictionary on ancient Chinese calligraphy. 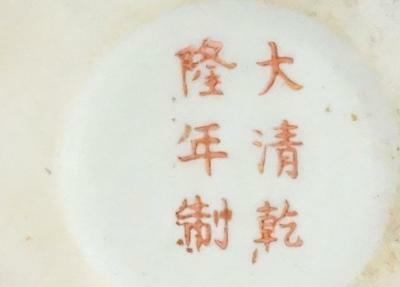 The character here is rarely used on written porcelain marks,except on stamps. 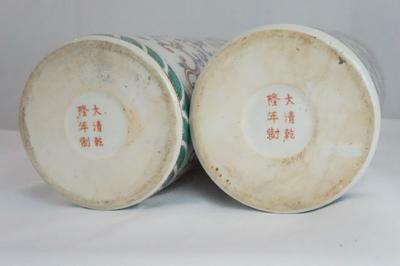 Please refer to Peter's 20th century Tonzhi marks. So my question is: Is this form of wiritng the character "made" a sign of the porcelain being made after the 60s? Hi, a clear picture of the bottom is normally required with every submission. It provides better information than the mark. The latter is an apocryphal Qianlong mark frequently used in the early republic. If the bottom and age sigsns are right, it could be from the early republic. The decoration would be right for that period, I think. Qianlong was what I was thinking but here are better pictures of the bottom. Shelley, I know we would all love to see your collection. I look forward to getting a peek. I'm still confused about these vases. I can't find anything that is similar. Is the consensus about the age 20th century? Last year,I saw a "simplified" version of "made" on a huge bronze bell made about 2000 years ago in the British museum. At the beginning of my collection, I bought a vase with the "simplified made" during the reign of Quangxu. Since I paid only 100€, I always assumed it is a fake. I'll show my collection to you all one day, once I have sorted out my collection. Shelley, the character 'zao' (造) may also appear occasionally, more often on Ming dynasty than Qing items.